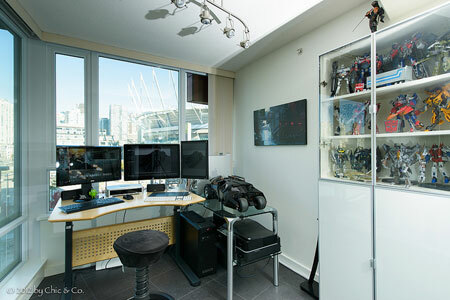 There are so many things to love about this home office, and the most obvious is its view of Vancouver, British Columbia, Canada. During the day, you can rest your eyes by looking at the hustle and bustle of the streets below, and at night the lights can be inspiring. A great view is a productivity benefit to any office. I’m also impressed by the hardware setup in this space. There is a good amount of equipment here, and all of it has a place that works for the user’s needs. The cable management is also nicely done. Another favorite piece in this office is the display shelving for the action figures and collectible toys in the cupboard. Nothing is crowded, the glass doors reduce the need for dusting, and the bottom of the cupboard is highly functional for storing office supplies. Thank you, Chic and Co., for adding your office to our Flickr pool and also for granting us permission to post your image on our site. Tomorrow is National Computer Security Day, 2012. This day was first recognized in 1988 and still serves as a reminder for all computer users to be safe and smart. Computer security is a huge topic, but I’ll use this post to focus on a single topic: online passwords. Entirely too many people use easily-guessed passwords or even the same one over and over again. Neither practice is a good idea. In this post I’ll share one app I use to generate secure passwords without requiring me to memorize a single one. I’ll also share a few tips for people to keep in mind. Let’s get started. I’ve been using 1Password from Agile Bits for a few years. I like it so much that I recommend it to everyone who uses online passwords. There’s so much to like about this software and almost everyone can use it: Mac owners, Windows users and even iPhone, iPad and Android users can get in on the security and piece of mind that 1Password offers. It has several great features, and the first is tipped off by the name. On your computer, 1Password has two components. The first is the app itself. This is the main repository for your passwords and more. You’ll use the application to enter information, change information and review it. The other component lives in your web browser. This simple button lets you log into sites for which you’ve saved a password and username, as well as create new ones. Of all the magic that 1Password performs, its greatest trick is that it only requires you to remember one password. This master password offers access to all the others. Once you’ve entered it, you can log into services like Facebook, Twitter, Amazon and just about anything else you can think of with a click. As long as you can remember the master password, there’s no need to memorize any of the others. 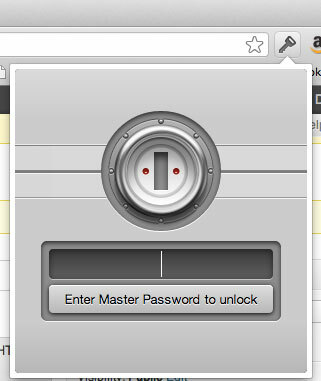 1Password also generates secure passwords. What do I mean by that? You pet’s name is not a secure password. Neither are your kids’ initials or your spouse’s birthday. Skip the name of the town you grew up in, too. In fact, almost anything you can pronounce and/or find in a dictionary is risky. Fortunately, 1Password can generate a secure password all on its own. For example, say you’re visiting a new site that requires a password. 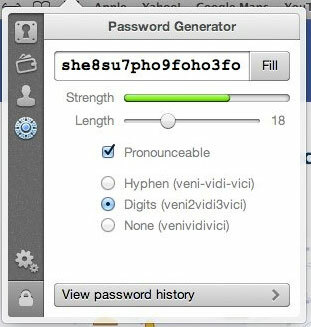 Once you create an account with a username and password, 1Password’s browser add-on will notice what you’ve done and offer to generate a long password with numbers, letters and symbols (you tell it how long you want it to be, too). Let it do so and save the result by typing the master password. Presto! Your new account is in place with a password that isn’t easily guessed. 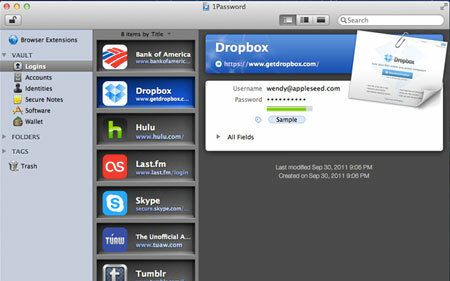 1Password works on your Mac or Windows machine, and mobile apps are available for the iPhone, iPad and several Android devices. What’s great is that over-the-air sync keeps them continually up-to-date. If you create a new or updated password on your Mac, for example, that change will be reflected on your iPhone or Android device. And, finally, it should go without saying, but no one was compensated to recommend this program. I’m seriously a user who likes the product. 1Password holds more than passwords and username. The desktop application can store account information, like iTunes or Google, notes you want to keep secure software registration information and even financial records and the like. It can even store your credit card information for easy completion on retail sites. It’s all secure and very handy. Finally, one other benefit of using iPassword is that it eliminates the tendency to use the same password over and over. I promise a couple of additional tricks for people who don’t want to use 1Password, and here we go. To create a reasonably secure password that you’ll be able to remember, shift your hands on the keyboard. Those of us who took a typing course remember the home keys: ASDFJKL;. Simply shift your hands one key to the right and start at SDFGKL;’. Now, type a long word or phrase that you’ll remember easily. Toss in a number or two and presto. You’ve got a password that looks like gobbledygook but is easy to recall. Finally, here’s one for iPhone owners. You might know that you can type special characters by pressing and holding on certain keys. For example, press and hold on “o” to produce “ô”, “ö” or “ò”, among others. Use one or more of those when setting up your passcode to help ensure no one will ever guess it. There you have it! Computer security is a huge topic, and using an app like 1Password is a small but crucial step in ensuring a safer web browsing experience. As I’ve mentioned before, I like wine. I like the farming, science, and technical aspects of creating it. I am fascinated by the marketing, sales, and distribution of it. I like talking to wine makers and sommeliers and distributors and retailers. I like reading articles about the wine industry and reviews. And, obviously, I like drinking it. Want to know what doesn’t require being charged or taking up a ton of space? A $10 corkscrew that works very, very well. And, since you can just pull the foil off the top of a bottle of wine, you don’t even need a foil cutter. The exception to all of this would be if you have hand issues and opening a bottle of wine is difficult for you. 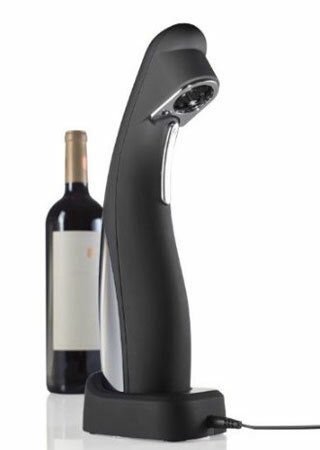 But, even if this is the case, a smaller, $20 battery operated wine opener is still a better option than this monstrosity you have to plug into your wall. The Automatic Wine Opener and Foil Cutter should appear in the dictionary next to the word OVERKILL. If you want a few more giggles, I recommend clicking on the product link and looking at the pictures of it being used. The device appears to be bigger than some of the bottles of wine being opened. Thanks to reader Clayton for leading us to this unitasker. A ZDNet article explores the answer to the question if a Kindle device saves money for college students and average readers. I was intrigued by the Puj Tub as a solution to small space baby bathing. 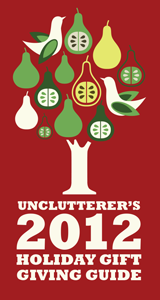 And, from all of us at Unclutterer, we hope you have a sane and clutter-free holiday season! Tomorrow is Thanksgiving here in the U.S., and millions of Americans will be gathering with friends and family to enjoy turkey, dressing, and pumpkin pie. I’m personally a fan of a dry brined roasted turkey, accompanied by very little family drama. However, I’m well aware that my way is not the only way and there are people who like their drama turned up to 11 and their birds fried to a crisp. I’ll admit, frying the bird does add a dangerous element to what might otherwise be an adventure-free day. Heck, just this week I learned from watching an Allstate Insurance advertisement that 15 people burned their houses completely to the ground last year as a result of frying Thanksgiving turkeys — now that IS adventurous! Frying a turkey indoors seems like a swell idea. I can’t think of a single thing that could possibly go wrong. Kids running around wouldn’t trip over any electrical cables, pulling scalding oil down on top of them. Great Aunt Martha who doesn’t have the best eyesight wouldn’t accidentally open it and burn the skin off her face. Nope. No risk of injury to anyone at your family gathering. 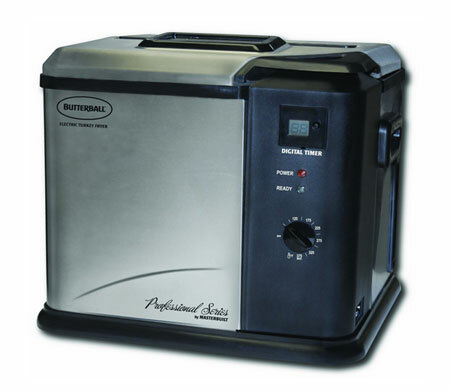 For those of you who like to serve turkeys that have been taking steroids, the Masterbuilt Butterball Professional Series Indoor Electric Turkey Fryer also comes in X-Large! Sweet. Nothing says, “I love you, family,” than using extra hot oil to wound your guests and catch your home on fire. Bonus: Dozens of you sent me a link to the (riddled with curse words) “Hater’s Guide to the Williams-Sonoma Catalog” this week, and I am so thankful you shared it with me. If you’re not at work and haven’t yet seen this entertaining diatribe about the unitaskers featured in this year’s holiday catalog, you should go and enjoy the rant. Piercey will make your hard boiled egg preparation easy and friendly. An Evernote Premium account. Evernote is my external brain. I use it for “cold storage” of reference material. That is, information that doesn’t require action but will be useful in the future. Evernote is great because it automatically syncs your information across almost any device with an Internet connection. It has very powerful search function, tagging, and more that makes it easy to find what you’re searching for in your stuff. The $45 premium account enables larger uploads, offline notebooks, improved upload speeds and collaboration with other users. Dropbox Pro account. Dropbox is so useful I almost think it should be installed on computers by default. The online storage solution is a fantastic way to backup important documents and share them with others. With Dropbox, you can access your stuff from nearly any Internet-connected computer. The pro account starts at $9.99 per month for 100 GB of online storage. I use it every single day. This Life pro account. I wrote about This Life earlier this year and I’m still enjoying it. This Life lets you organize and share your photos and videos easily and with a beautiful interface. Uploading photos is easy, as is creating “Stories.” This Life Stories collections of photos that you’d like to group together, like those of a certain person, trip, location, time period or whatever you desire. It’s browser-based so, like the other applications I’ve suggested to far, it doesn’t’ matter if you own a Mac or a Windows machine. There’s also a great app for the iPhone and iPad. The Family Plan lets you upload and share 50,000 photos or 25 hours of HD video (1080p) for $14.99 per month. Backup software. This is the gift that keeps on saving, not giving. As a Mac user I recommend Dolly Drive. Named for Dolly the cloned sheep (get it? ), Dolly Drive uses Apple’s own Time Machine software to save your backup remotely, or “in the cloud.” I’ve been using it for years now and it’s always worked. Local backups are important – like a hard drive in your house or office – but remote backups are even more so. Dolly Drive puts your backup on their own server. That way, a laptop can back up anytime, even when it’s not in your home. Dolly Drive starts at just $3 per month. Windows users should consider Carbonite for similar, remote, automatic backups that start at $59/year. And, Erin swears by Backblaze. Irrespective of the program you choose, backup your computer and make sure your loved one’s computers are backed up, too. OmniFocus from The Omni Group. Forgive me while I recommend a Mac-only app here. OmniFocus is the big daddy of project management apps on the Mac. It’s so flexible and powerful that I can only touch the surface of its capabilities in this post. It was built with David Allen’s Getting Things Done system in mind, but you needn’t follow that method to use OmniFocus. Easily create projects and their associated tasks. Break them down by category, context or location. Keyboard support is extensive, so you can flip from one function to another easily. My favorite features let you focus on one project at a time, hiding everything else on the screen, while review mode let’s you see what’s outstanding at a glance. OmniFocus is $79.99. BreakTime and Focus Booster. I work best when I schedule in break times. BreakTime is the app I use for this purpose. It’s a Mac app that sits in your menu bar and counts down timed work sessions and break sessions. I work for 25 minutes and then take a break for five. Then, I repeat the process. It keeps me moving and allows for some time to “goof off,” walk around, etc. If you’re not a Mac user, consider Focus Booster. BreakTime costs $4.99 and Focus Booster is free. 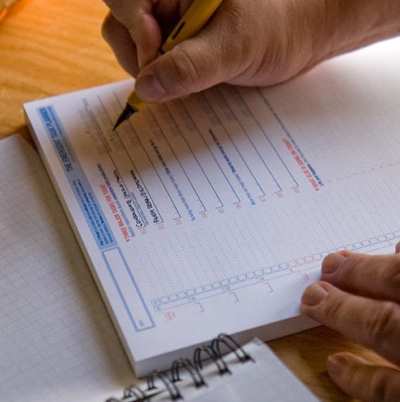 I’m recommending the Emergent Task Planner notebook. I use one of these every day. It allows you to list the most important tasks you wish to accomplish, estimate how long they’ll take, recored how long they actually take and recored notes/incoming stuff or ideas that pop up while you work. There’s even a small, travel sized edition. I really do use this every day. The full 2012 Holiday Gift Giving Guide. Giving gifts can be lots of fun for both the recipient and the giver. And, although you can elect to give presents that are service related, there’s nothing like watching someone enthusiastically tear open a package you picked out just for them. If you have a tough time finding the right gift (one that will be liked and appreciated), I find that it helps to pick presents that match the recipient’s personality. And, when possible, why not select something that’s helpful and fun? Not every present has to bring a smile to their face, but if it helps them get stuff done and makes them chuckle, they’re likely to use it often. Of course, you can buy yourself a whimsical and useful present, too. For a bit of inspiration, check out these interesting gifts that put the fun in functional. 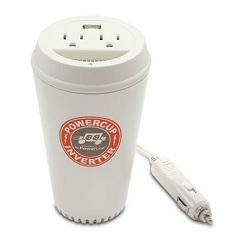 Coffee Cup Inverter with USB Charging Port. Who doesn’t charge their gadgets while they’re driving? This coffee cup fits in your car’s cup holder (though you have to remember this it’s not really a coffee cup) and it also comes with two power outlets. USB Hubman. The USB Hubman (or the USB Hubdog or the 4-legged Octopus) is fun way to add an extra port to connect your devices. It’s small (great stocking stuffer) and lightweight, so it can be the perfect gift for those on the go. Makey Makey Invention Kit. This is an inventors kit that almost anyone can use. It requires no tools and can be connected to everyday items to give commands to your computer (via a USB cable). Joseph Joseph Elevate 6-Piece Heat-Resistant Utensil Set. This six-piece set is colorful and weighted so that the business end is raised (and doesn’t touch the counter). Store them in a utensil drawer or purchase the Carousel Set. Joseph Joseph Rinse and chop Chopping Board and Colander. Another cool and colorful item from Joseph Joseph that the chefs in your life are bound to love because it serves two purposes: it’s a chopping board and a colander in one (folding hinges do the trick). And, because it can lay flat, it’s can be stored easily when not in use. Falling bookend. Bookends may sound boring, but this model by Artori will add a touch of drama to any bookshelf (check out the Portal 2 bookends, too). Gnome-Be-Gone Office Fisherman. This office gnome captures paper clips with his magnetic fishing rod and keeps a (neat) stash of business cards, too. There is one more that product I just couldn’t resist telling you about. Though the price is well beyond what I think is reasonable, it gets lots of cool points for doing it’s job in a unique way. 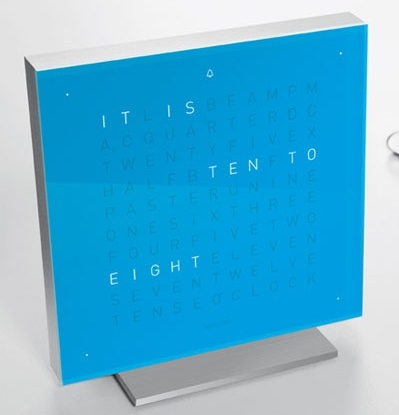 Take a look at the QLOCKTWO. It’s a wall clock that has no hands and no numbers. Just words that tell you what time it is (“It’s a quarter past eight”). The QLOCKTWO comes in a variety of colors and supports twelve languages (the QLOCKTWO TOUCH has a snooze button). In practice, the Fizz Saver 2-Liter Soda Soft Drink Dispenser is an accident waiting to happen. One of the things I discovered during my uncluttering process is that silver wrapping paper works for every gift-giving occasion — weddings, anniversaries, birthdays, baby showers, housewarming, etc. — and when you only have a few tubes of wrapping paper to store, it takes up very little space in a closet. I currently store all cleaning products in a cupboard underneath my kitchen sink. Products include polishes, all household detergents, sponges, laundry liquids, waste disposal bags, scourers etc. I cant seem to think through a convenient and neat way to store these given the depth and dimensions of this cupboard. Please help. The area under the kitchen sink (or even a bathroom sink) is a weird area where supplies often go to get leaked upon. If your pipe bursts or drips, all of these products will be soaked. This isn’t such a bad thing for sponges, bags, and scourers, but can ruin detergents and polishes. Additionally, the easy access to this area makes it prime for visits from children and pets who can be poisoned or made very ill by toxic polishes and detergents or could be suffocated by a plastic bag. Even if you don’t have children or pets, there is a strong likelihood at some point in your life there will be one visiting your home. Noting this, the first thing I recommend doing is sorting through everything under your sink. Make three piles: keep under the sink, store someplace else, and purge. Place items that can’t be ruined in the event of a leak and that are completely safe for children and pets in the pile of things to continue to store under the sink (sponges, scourers). Place items that are dangerous for children and pets (laundry detergent, plastic bags) in the pile of things to be stored someplace else. And then, purge anything that is expired, oozing, or has gone rancid. The next step is to purge all the items that belong in the trash. If any of your items are hazardous materials, as some polishes are, be sure to follow your city/county/country’s laws for proper disposal. After getting rid of the yucky stuff, it’s time to find homes for all of those items that don’t belong in storage under a sink. Polishes and laundry detergents belong on high shelves, preferably in locked rooms or locked cabinets. Regular dish detergent, which isn’t toxic in small doses, can probably just be stored on a higher shelf in your kitchen. If you are limited on space, maybe you’ll decided to continue to store these items under your sink, but if you do please get a childproof cabinet lock that you can put on the door whenever a child or pet comes into your home. However, a cabinet lock won’t protect these items if your water pipes ever leak or burst. There are other styles (ones that don’t attach to the wall but serve the same function, ones that don’t slide but are shallow so nothing gets pushed to the back of your cabinet and that wrap around your pipes) if this particular one doesn’t exactly suit your needs. 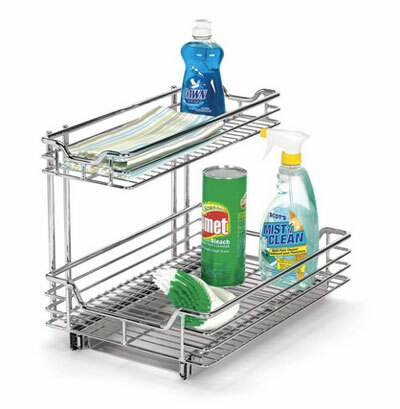 Just try to find an organizer that takes advantage of the height of the cabinet and makes it easy to access items stored in the space. And, as is the case when storing any items in a cupboard, group like items with like items (all sponges together) so it is visually obvious whenever you open the cabinet how much of any type of thing you have, as well as where it is and where to return it. Thank you, Yasmeen, for submitting your question for our Ask Unclutterer column. Please check the comments for even more ideas from our readers.